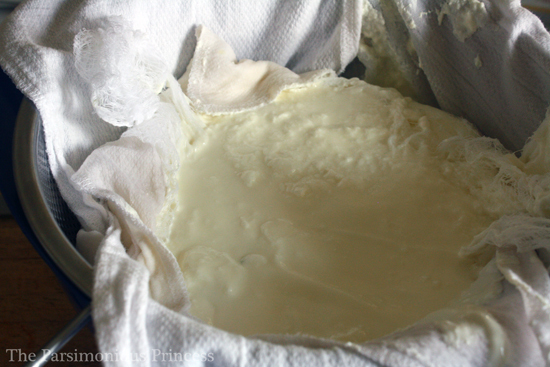 Have you tried making your own yogurt yet? See, I told you it was easy! Without question, I prefer Greek yogurt over regular. I remember the first time I ever tried Greek yogurt (mmmm....Chobani pineapple. Yum. ), I was surprised how it tasted more like a dessert than the yogurt I was used to. Since that first taste, I haven't been able to eat regular yogurt; it just seems too watery. This kept me from making my own yogurt for a while -- I wasn't ready to give up my Chobani yogurt. Turns out, making your yogurt Greek is simple. The difference between regular yogurt and Greek is that the Greek yogurt has been strained, removing the whey, hence the creamier texture. Line the colander/strainer with the thin cloth. This can be from a variety of sources. 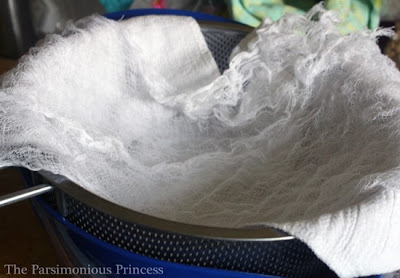 I ran out of cheesecloth (which wasn't working that well anyway since I'd bought cheap grocery store kind that doesn't have a very fine weave), so I improvised with some my cloth napkins that are made out of birdseye cotton (it's the same kind of cloth used for diapers. I got my cloth napkins from Etsy -- I love them. ), with the cheesecloth I had left layered on top of that. They worked even better than the layers of cheesecloth I'd used before (plus cheesecloth can get kind of pricey). You could use a thin tea towel or some muslin cloth, too. I've also read about people using paper towel and paper coffee filters. Personally, I like the idea using cloth over paper since it's reusable, but work with what you've got. 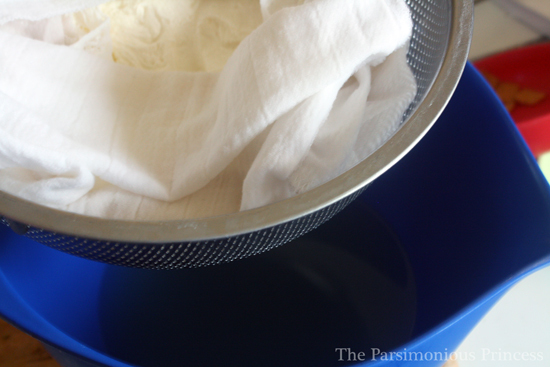 Put the strainer over the large bowl and then pour your yogurt into the cloth (or whatever you choose to use). 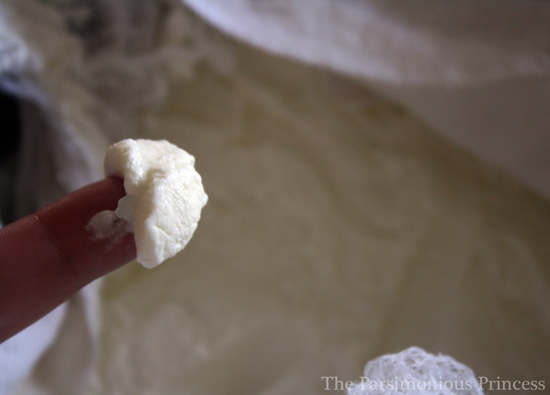 Fold the edges of the cloth over the yogurt and put it (the whole shebang: bowl, strainer, yogurt, etc) into the fridge for 1-2 hours. Really, you can let it strain as long or short as you want, until it gets to the consistency you like. I strained mine for a couple hours and it got to that consistency I love. It's not the best picture, but if you look closely, you can see where I got my fingerful of yogurt in the lower-right corner. Totally strained and creamy. Yum! Once you've strained your yogurt, you'll see that there's liquid collected in the bowl under the strainer. Whatever you do, don't throw that out!! That clear, yellowish liquid is the whey and it's actually quite useful and really good for you. 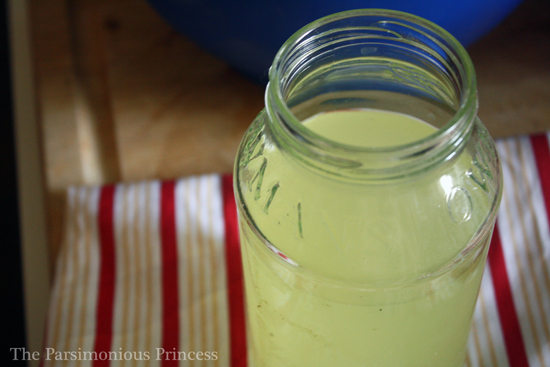 For a great post about whey and how to use it (she has 16 different uses for it! ), check out this link. 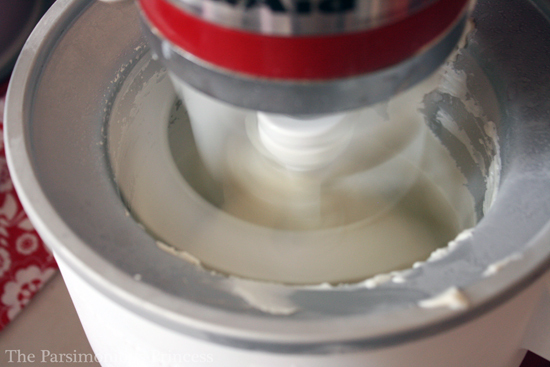 If you're not going to use your whey in a couple days or so, you can freeze it for later. I freeze mine in jars. My boys' pediatrician (remember, the guy who finally convinced me to give this yogurt making a go) said he freezes whey in an ice cube tray (yet another use for them -- what a useful kitchen tool!) and then will pop a couple cubes into the smoothies he makes (since whey is full of protein and vitamins). The only downside to making your yogurt Greek: it does cut your yield down. Because of the straining, you'll end up with less yogurt than you started with (obviously) -- how much less depends on how much you strain it. Want to make your homemade Greek yogurt even more delicious? Make frozen yogurt! My husband has been on a certain kick lately: he loves plain, tangy frozen yogurt. You know, the kind at those places where it's self-serve and you can load it with toppings. Knowing this, I thought it'd be fun to try to use my newfound yogurt-making skill to make one of his favorite treats. Time to pull out the ol' ice cream maker attachment for my Kitchen-Aid. 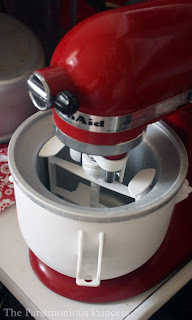 I got the ice cream attachment a few years ago for Christmas from my husband. Really, it's the gift that keeps on giving. Throw some cream, and some sugar into that bowl (after the bowl has been chilled in the freezer for several hours) and you've got ice cream that makes the store-bought stuff taste like...well...a sorry excuse for ice cream. I'd never made frozen yogurt before but I figured it couldn't be much different than making ice cream. It wasn't. You simply mix the yogurt with some sugar and stick it in the fridge for an hour. I used less sugar in my version than was called for in the recipe because we still wanted the tangy flavor of the yogurt to come out. Once it chilled in the fridge, I poured it into the already-started machine and let it the Kitchen-Aid work its magic. I was going to dish up the frozen yogurt into a cute little bowl with a pretty placemat underneath, with some of the raspberries from my yard (yay!) daintily placed on top. Nope. It didn't make it that far. No way were were going to risk that stuff melting while I tried to style it just-so and get a un-blurry photo. Basically, I split it between the hubs and I in a couple oversized mugs, gave the obligatory offer to the boys (they didn't want any -- hooray! ), tossed some of the raspberries on it, and stuck a couple spoons in each mug. Nothing fancy here. But the taste. Oh my goodness. I'm not exaggerating at all when I say it was one of the most delicious things I've eaten lately. It was divine. You owe it to yourself to make this homemade frozen yogurt. It may be one of my favorite homemade vs. pre-made accomplishments yet. The best bread I ever make is when I use whey instead of water! I make artisan bread in 5, and one recipe uses up a ton of whey. I just commented on that other yogurt post and here you are talking about Greek Yogurt. I'll have to try this frozen, freezing the whey... no way!? Excellent idea! Making bread with it is awesome too. Hey Taylor-Made! If you have a food processor you can use it. 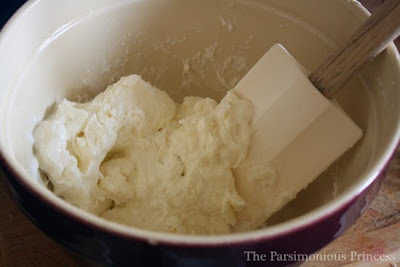 Just freeze the yogurt, once frozen break it up and process it in the food processor. Then put it back in the freezer to refreeze. You may want to reprocess it again but when I did pureed fruit this way I didn't need to. BTW T-M, I'm just down the road from you! In Allen, Texas. LOL, I know your Uncle Julio! He's famous! Oh Yum! I can't wait to try this. I just made yogurt this weekend (I usually make it in the insert of my crockpot, wrapped in a towel in the oven) but my daughter found a YoLife yogurt maker at a thrift store so I tried that. The stuff is kind of bland?? Not tangy. Maybe I didn't leave it in there long enough and I did scrimp on the real yogurt I used for culture since I only had half a single serving of store bought yogurt. Either way, I think I'll strain it and it should make a better texture. And I can make frozen yogurt with it. Wa-hoo! Sounds delish. 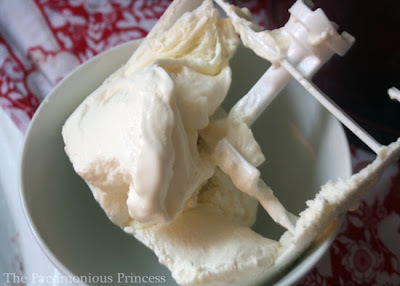 I have a Cuisinart icecream maker and I use the thing all the time. Thanks for the post on this. Sounds great! I'll let you know how it goes.